atMany clients send us emails asking the differences between injected hair systems, After learning about them, they can make sound decisions about suitable hair systems. Here, we’d like to share that knowledge with you. An Injected hair system is a hairpiece with hair injected into a skin or silicon base which is not available on lace bases. The injected hair systems we make are Flat and Lift Injected systems. 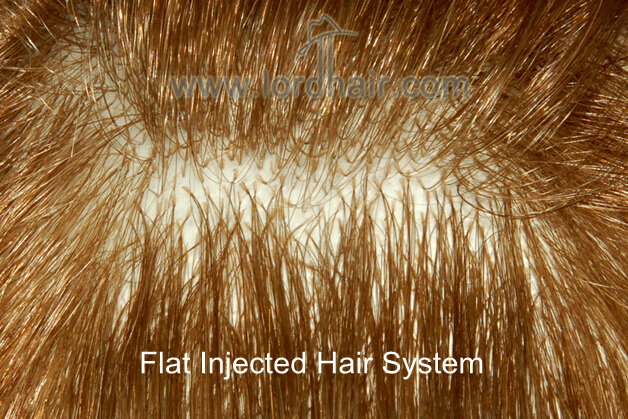 Flat injected hair system: Hair is injected into the skin or silicon base at an acute angle, i.e. the hair is not perpendicular to the base. In the picture below, you can see that the hair root is not perpendicular to the base and naturally falls to one direction. Actually, the hair can only be combed in one direction and cannot go to in the opposite direction. It will keep the same direction even if you don’t comb it. The skin base is usually thin and soft. Flat injected hair systems are suitable for most partings, excluding pompadour. 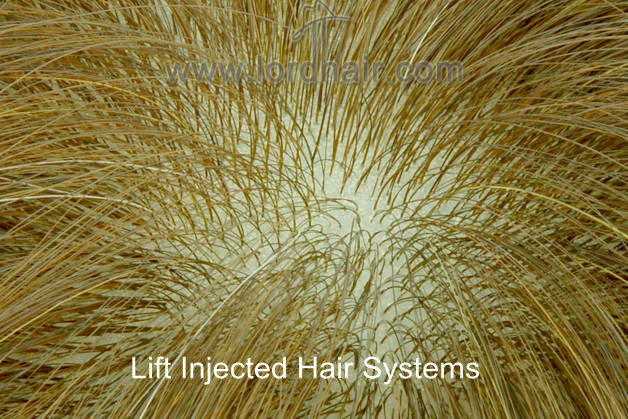 Lift injected hair systems: Hair is injected into the skin or silicon base at a right angle, i.e. the hair is perpendicular to the base. Thus you can comb the hair in any direction you wish. The hair looks fluffy and thick and is suitable for creating various kinds of hairstyles, including pompadour. The base material of lift injected hair systems is usually thicker than that of flat injected hair system, so the base can hold the hair root firmly. That is to say, super thin skin base or ultra-thin skin base cannot be used to make a lift injected hair system. In other words, if you prefer a thinner skin base, choose a flat injected hair system. If you prefer the hair to go in any direction, a lift injected hair system would be a great choice for you.